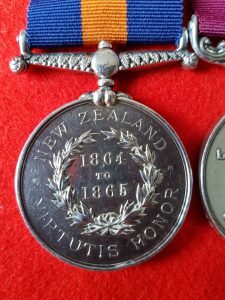 John Hayward was awarded the New Zealand Medal for his part in the Waikato Campaign and records show (British Battles and Medals) that only 25 medals were awarded to the 65th Regiment of Foot with this particular reverse. John Hayward was an 18 year old, born in North Bradley, Trowbridge, Wiltshire. 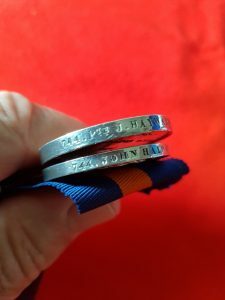 He served in excess of 21 years with the 65th Regiment of Foot, 2nd Yorkshire, North Riding later York and Lancaster Regiment and his discharge papers, which are on-line, confirm the award of the NZ Medal and the Long Service and Good Conduct Medal. Posted in 65th Foot, 65th Regiment of Foot, Antiques, long service and good conduct medal, maori wars, medals, Medals, New Zealand Medal, New Zealand Wars, Victorian Military Campaigns, York and Lancaster RegimentTagged 65th foor, 65th Regiment of Foot, long service and good conduct medal, maori wars, maori wars medal, New Zealand Medal, nz medal, waikato campaign, waikato campaign medal, york and lancaster regiemnt, Yorkshire RegimentBookmark the permalink.